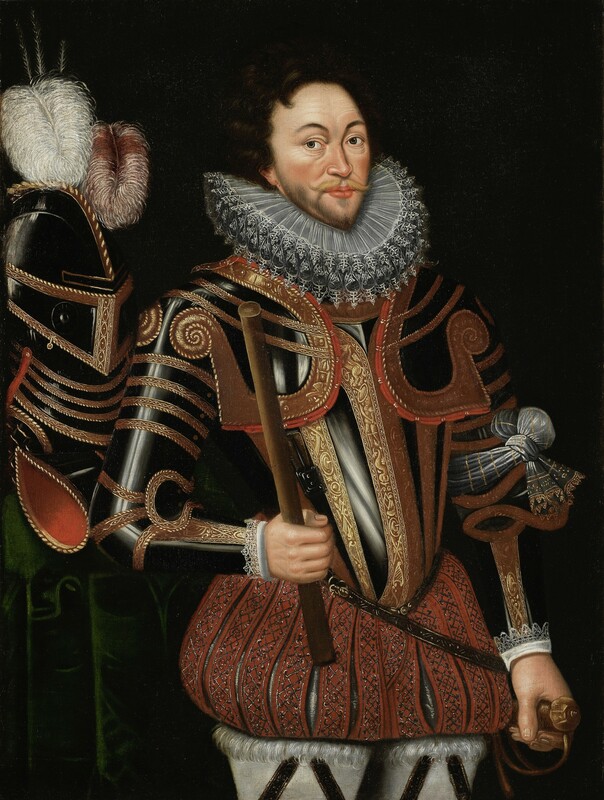 A portrait of Sir Francis Drake recently identified by the wart on his nose is going up for auction at Bonhams’ July 4th Old Master sale in London. Portraits of Drake painted from life are extremely rare. The wart doesn’t appear in later works and reproductions. Its presence on this work marked the sitter as Drake himself (it had been misidentified as his partner and rival Sir John Norreys) and the painting as one of the earliest made of the famed pirate, explorer and hero of the showdown with the Spanish Armada. Under his own command in the early 1570s Drake established a thriving and hugely lucrative career in piracy, attacking Spanish shipping and settlements in Caribbean. Drake and his crew plundered coin and cargo from clothing to slaves, amassing so much merchandise it wouldn’t fit on their ships and had to use boats they’d raided to carry it. When he returned to Plymouth from one of those voyages in June of 1571, he had three ships full of 100,000 pounds worth of Spanish goods, cash and slaves, the equivalent of a quarter of the yearly income of the English crown. In 1573 he captured the Spanish Silver Train, 14 mules laden with 20 tons of Peruvian gold, silver and gems, in Nombre de Dios on the Atlantic coast of Panama. This daring exploit made him a big celebrity back home, even though the government could not officially acknowledge his success (and the massive boost it provided Elizabeth’s treasury) because of a recent truce signed with Philip II of Spain. Flush with plunder, the adulation of crowds and keen to climb the social ladder, Drake invested his plunder money in Walter Devereux, 1st Earl of Essex’s campaign to subdue Ulster. In 1575, Drake joined the fight in person, deploying the same ships he’d used to harry the small inlets of the Caribbean against the coast of Antrim. Drake’s fleet was critical to Essex’s taking of Rathlin Island, refuge of Clan MacDonnell. Cannon fire from the ships breached the walls of the castle forcing its surrender. Essex then slaughtered everyone, the surrendered officers and troops, the elderly, women and children who had sought shelter in its in caves. It was against this backdrop of his increasing wealth and standing that the portrait was painted. He is depicted in great military finery, wearing a set of blackened and gilded half-armour etched with symbols of arms (crossed swords, shields, horses, halberds, spears). It’s a style of armour manufactured in northern Italy, likely Milan, and would have been extraordinary expensive. A matching beplumed jousting helmet is on a table to his right. The nouveau-riche Drake, son of a Devonshire farmer, could never claim the status of ancient nobility symbolized by the jousting armour, but he could buy the trappings of it and have himself painted showing them off. In his left hand he holds a rapier. In his right a ceremonial baton, the sign of high-ranking military officer who has commanded troops in battle. Commander’s batons were usually presented to distinguished field generals by the king (or queen in this case). The Atrim expedition was a private venture funded by Essex and investors for profit (albeit with the agreement of the crown). Drake didn’t get Queen Elizabeth I’s backing for his raids until the late 1570s and he wasn’t even knighted until 1581, so this is a rather generous self-assessment for a privateer, to put it mildly. The portrait has been on display for the past two years at Buckland Abbey, Drake’s home, purchased after his return from circumnavigating the globe, now administered by the National Trust. They declined to purchase it. If Bonhams pre-sale estimate of $400,000 – 670,000 is anything to go by, they may simply not have been able to afford it. This entry was posted on Tuesday, June 12th, 2018 at 10:28 PM	and is filed under Modern(ish). You can follow any responses to this entry through the RSS 2.0 feed. You can skip to the end and leave a response. Pinging is currently not allowed. As they say “warts and all”. Shows great confidence in his persona. 14 mules for 20 tons, so about a ton and a half per mule? Presumably in wagons? I wonder what the lace tied around his arm is intended to signify? The lace is likely a lady’s favor, a piece of cloth (glove, sleeve, etc.) given by a lady to a knight at a jousting tournament, and attached by him to his lance, helmet, or arm. Did he color his mustache? Or did he darken his hair? There is another painting, purpointed to be Drake, that show him as a redhead. I assume you meant ‘purported’. Yes that portrait was painted by Hilliard during Drake’s lifetime. No wart though?